Ever since I first fixed up my Supercub, I’ve been pretty good about keeping the chain in good condition. 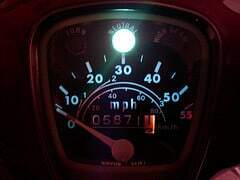 There’s plenty of debate as to the best way to take care of the chain, but a trusted source on the Honda C70 Yahoo! Group used PJ1-Black so I bought a can and used it. It seemed to work well, and when I got my GS, I kept on using it. A guy at the local motorcycle dealership gave me some more tips on cleaning the chain and I’ve been using the technique he gave me. 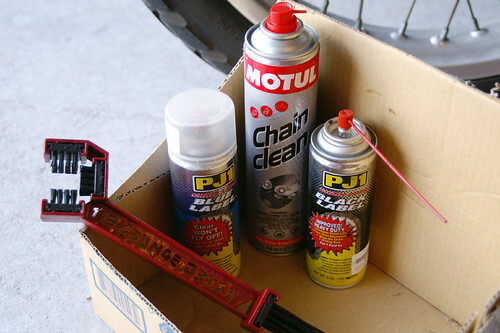 Basically use some chain cleaner (I have the Motul stuff) and a brush (I have a grunge brush) to clean the chain. Wipe off with a rag. Then go for a short ride to warm up the chain a bit and finally apply your lube of choice. Let the lube set for a couple hours and then you are good to go. Like I said earlier, PJ1-Black seems to work fine, but I think I spray on too much of the stuff. The sprocket cover has quite a bit of the black gunk on it. Cleaning that off was a messy affair! I did recently find a can of PJ1-Blue while cleaning up the garage. Not sure when I bought this but I might as well give it a try sometime. But after reading a bit more, I think I will try just using Automatic Transmission Fluid. The advantage of this is that it will clean and lube all in one shot. Plus ATF is really cheap, and I like the CBOA approach. Some people apply it with a brush, while others use a spray bottle. I guess I will use a brush and see how it goes. Anyways, after 7,000 miles my chain and sprockets still look great. I really don’t know if the lubes really help all that much or if it is just another way to spend money. From what I have read, I think that the most important thing is to keep the chain clean and free from dirt and grime and the tension adjusted correctly. Incidentally, I just saw a video from Touratech and Helge Pederson where he talks a bit about chain maintenance. Enjoy!